10:00 What would you expect a Girl Scout, who wants to be a teacher, to choose as a community service project to earn her Silver Award? You’d expect them to plan a project to help students. That’s just what 14-year-old Destiny Herrington has done. Destiny recently bridged to be a Senior Girl Scout Troop 296 which meets at Glen Burnie Baptist Church. She is completing her Silver Award by organizing a school supply drive to provide filled backpacks for students at Richard Henry Lee Elementary School when they go back to school this fall. Destiny attended Richard Henry Lee and it’s where she first became involved with Girl Scouts. She will enter Glen Burnie High School as a freshman this fall and has her sights set on attending college to be a teacher. Destiny said she organized the school supply drive to give back to her community. “There’s less fortunate kids whose parents don’t have enough money who can’t get the right materials they need for a great education,” she said. 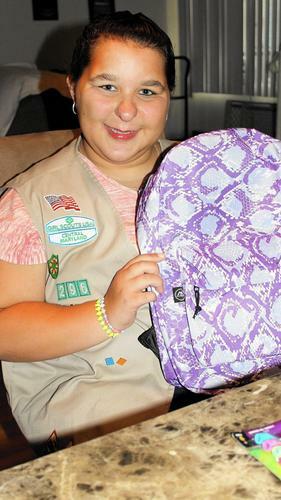 Destiny said that once or twice each week, she collects and organizes the donations to pack them into backpacks. Destiny makes a list of what she needs to supplement the donations and her mom Michelle Herrington drives her to Walmart to go shopping. She pays for the school supplies with cash donations she’s received. To date, she has 48 stuffed backpacks that each contain: two folders, two composition books, a pencil case or box, two glue sticks, 8- to 10 pencils, a dry erase marker, two erasers, a pencil sharpener, a box of washable markers, a box of crayons, a box of colored pencils, scissors and a personal package of tissues. Destiny has a separate box of donated items that aren’t on her backpack list that also will be donated to Richard Henry Lee. Girl Scouts have the opportunity to earn Bronze, Silver and Gold Awards. Bronze awards are group projects that teach Junior Girl Scouts how to work as a team. Girl Scouts can choose to work on the Silver Award individually, or as a group. Most Girl Scouts that pursue the Silver Award on their own spend at least 50 hours on their community service project. They are encouraged to identify a community problem and then develop an action plan to rectify it. The Gold Award is the highest honor a Girl Scout can earn. Destiny joined Girl Scouts as a Brownie. Her mom also participated as an assistant leader. It’s also where she met her best friend, Kennedy Cole. Kennedy, who lives in Crofton, is also working on her Silver Award. She’s collecting school supplies to ship to Nicaraguan students. Destiny said her troop membership ranges from 10 to 14 girls and they’ve stayed together in the same troop since they joined Girl Scouts. Her favorite badges were the zip line badge and “Make Your Own Badge,” which is a badge the Girl Scouts design themselves. Destiny designed her badge around bullying. It’s a topic close to her heart. She was a bullying victim until she took Taekwondo lessons and earned her green belt. Her favorite activities are biking, swimming, camping and spending time with her friends. Destiny’s family spends most weekends camping in Pennsylvania. Destiny set up collection bins for donations at the campground and her fellow campers have generously supported the project. Donations to help Destiny complete her project can be dropped off at the offices of Dr. Surya P. Mundra, 8021 Ritchie Hwy Ste 202, Pasadena, MD 21122. Cash donations can be donated through her “GoFundMe” page. This article was republished via Capital Gazette. Contact Kathleen Shatt at 410-766-8547 or kasmgfern@hotmail.com or fax her at 410-766-1520.